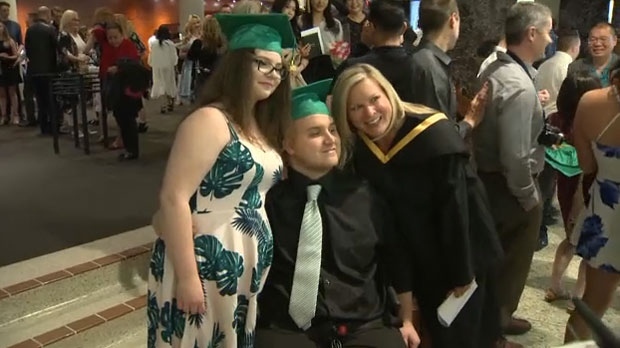 A Calgary teenager, seriously injured in a 2015 sledding accident, made a lasting impression at Bowness High School's graduation ceremony by doing away with his wheelchair and crossing the stage on foot in an exoskeleton suit to receive his diploma. Alex McEwan, 17, was the last of the graduating class of approximately 200 students to be called during Monday’s ceremony. The wheelchair-bound teen shocked nearly everyone in attendance by walking the stage of the Southern Alberta Jubilee Auditorium in a robotic suit using forearm crutches for support. On December 21, 2015, Alex was celebrating his 15th birthday with friends on an unsanctioned tobogganing hill in Silver Springs when his sled rotated and he struck a pole headfirst. Following the crash, the teen was unable to feel his legs and hospital tests confirmed he had broken three vertebrae. 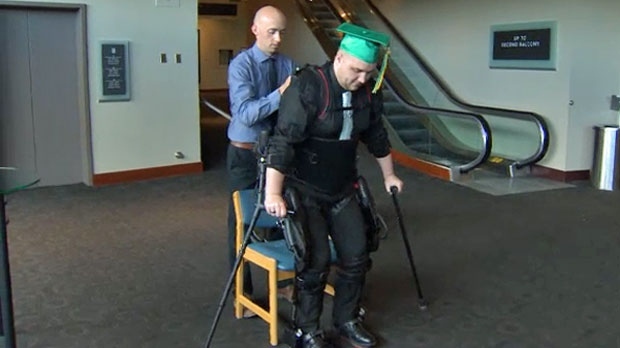 Kyle McIntosh, a neurological-physiotherapist at Foothills Medical Centre, worked with Alex and the exoskeleton suit in preparation for the ceremony. Alex’s parents had seen their son, the oldest of their four boys, walk with the use of the exoskeleton suit before but say watching him on stage was a completely different experience. The exoskeleton suit was part of a recently concluded research project funded by the Calgary Health Trust through the Alberta Paraplegic Foundation and Hotchkiss Brain Institute. The relatively new technology will continue to be used by select patients with life altering injuries at the Foothills Medical Centre.